A meeting is to take place in Limerick tonight aimed at opposing household and water taxes. Organisers are urging people to get involved and refuse to pay the charges, which campaigners say are taxes designed to bail out the banks. The Campaign Against Household and Water Taxes group also says the charges could rise within a couple of years to €1,000 or more, leaving already cash-strapped homeowners in a very difficult position. Spokesperson for the Limerick group Cian Prenderville said: “If people stick together, if we have up to one million households refusing to pay this tax, we can make their threats of fines unworkable and un-implementable, just like we did with the water charges in the past. 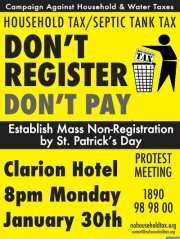 The rally takes place in the Clarion Hotel on Steamboat Quay from 8pm to 10pm. Rising Mortgage Debt: Are there any solutions?